I find myself dumbfounded on occasion, maybe even frequently. Last year I purchased a large witch hazel (seven feet tall and nearly as wide) that was labelled by the grower as Hamamelis virginiana, the native witch hazel of the mid Atlantic. My confusion began when the leaves dropped in early November. The leaves are not supposed to drop, at least not that early. The foliage of Virginia witch hazel turns to yellow in October, sometimes a striking, glowing yellow, and other times a drab, tired yellow, but it persists (and this is a big drawback) to obscure the small ribbon-like blooms in late autumn. This wasn’t happening. First, the leaves fell off, then I waited through another month and there were no blooms. There were plenty of buds that were quite obvious without leaves in the way, but they showed no sign that they’d flower any time soon. Now, I consider myself to be a patient and laid back person (though no one else seems to agree), but I was concerned and a bit agitated. Had I screwed something up? Was my witch hazel damaged, or dying? Why wasn’t it doing what it’s supposed to do? I suppose that the gardener’s first inclination is to suspect that they’ve done something wrong, but what? The buds were very witch hazel like, and the leaves (before they dropped) were definitely witch hazel leaves, but what kind? I went to the references, and sure enough, the growth habit of the Virginia witch hazel didn’t match the egg shaped form of my large shrub. I read further. Aha! It seems that the rounded shape is clearly the habit of the Vernal witch hazel (Hamamelis vernalis, above) which is native to states just to the west of the Blue Ridge Mountains. In fact, this shrub was purchased from a tree grower in central Tennessee, the witch hazel’s native habitat. The foliage of Vernal witch hazel does not persist, and it flowers in mid to late winter so that the blooms are in full, open view. 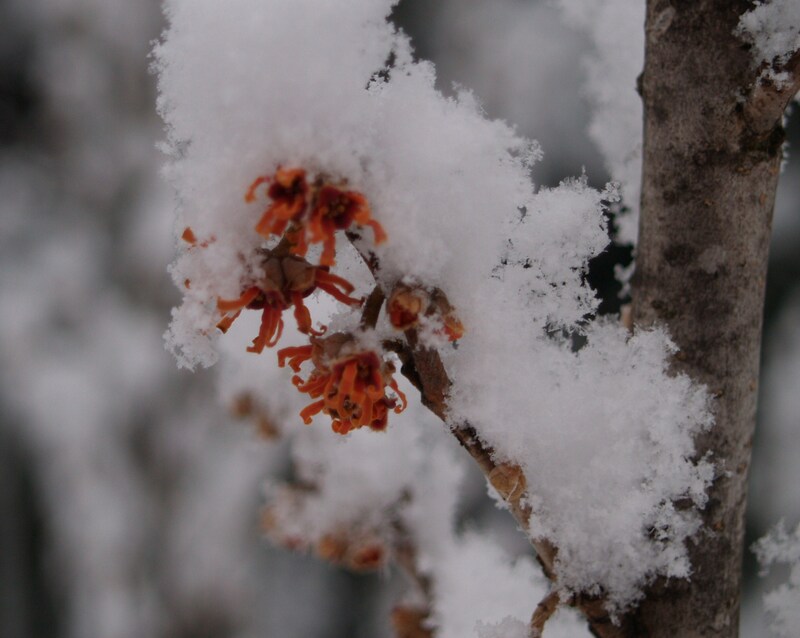 The flowers are ribbon-like and fragrant, similar to other witch hazels, but only a half inch long, much shorter than the hybrids that flower several weeks later. 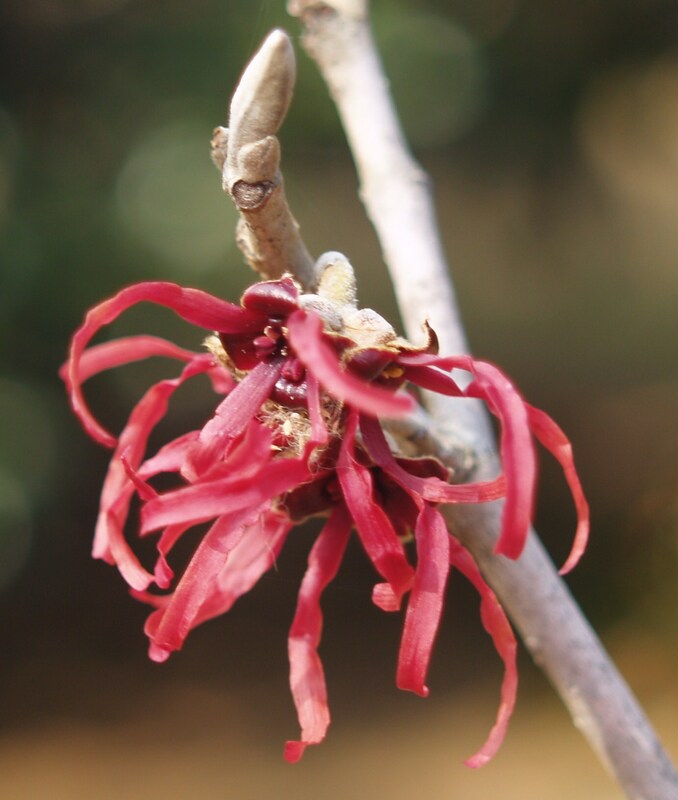 Plants grown from seed often exhibit variability in one form or another, and the flowers of the Vernal witch hazel are usually yellow, but can be rust colored. I’m a bit color blind, but I know that the flowers of this witch hazel aren’t yellow, and I’m not quite certain they’re rust either. Whatever color the flowers are, I need to get about a foot away before I can see them, but they’re plenty fragrant. I guess this has worked itself out. I don’t know if I’m relieved or disappointed the shrub isn’t the native Virginia witch hazel, but it is what it is (which is exactly what a laid back person would say). Anyway, this is a bit of a long winded way of getting around to saying that the Vernal witch hazel is in full bloom at the middle of February, and it’s been that way for several weeks with the first flowers appearing early in January. Of course, the unusually warm temperatures this winter have plants as confused as I am, so this might be the last time it begins to flower in January. 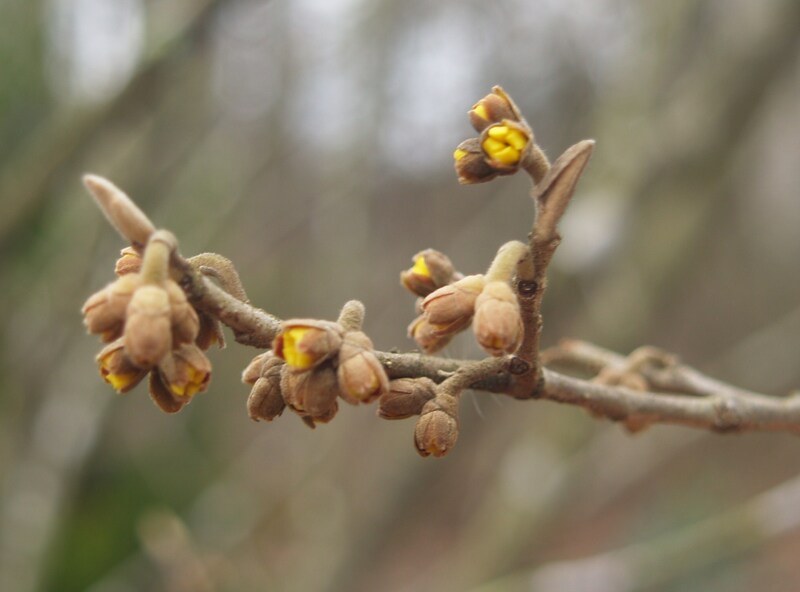 The hybrid witch hazels popped into bloom early in February, and this is a week or two early for them. Regardless of frigid temperatures or three feet of snow on the ground the bright yellow flowered ‘Arnold Promise’ (Hamamelis x media ‘Arnold Promise’, above) begins to flower almost precisely in the middle of February, but this year it’s early. 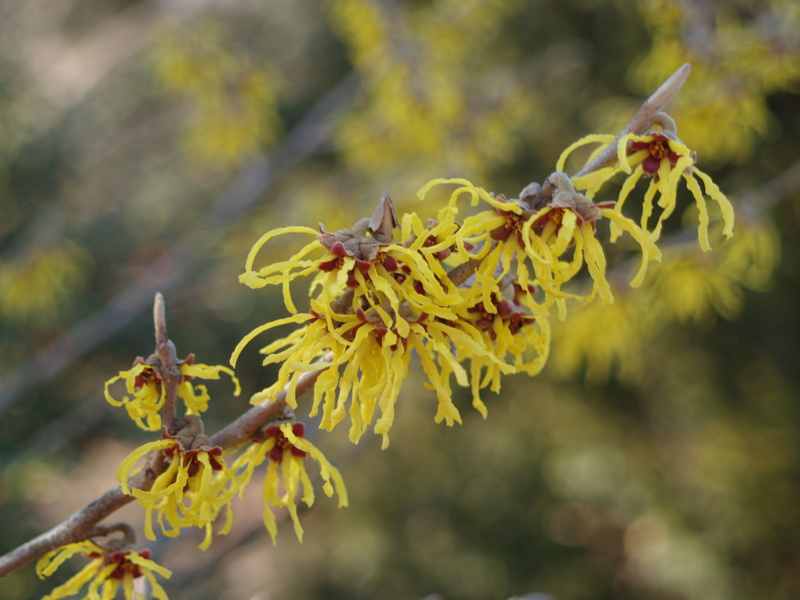 The flowers of ‘Arnold Promise’ are larger and more significant than the vernal witch hazel (or the Virginia witch hazel), and since the hybrids are propagated by cuttings or grafting the genetic variation of seedlings is eliminated and the blooms are dependably bright yellow. The scent seems to be magnified as well, and even with my diminished sense of smell I often notice it from halfway across the garden. The red to rusty red colored flowers of ‘Diane’ seem never to be as abundant as on ‘Arnold Promise’, and with my partial color blindness the blooms hardly stand out. ‘Diane’ (above) flowers slightly later, but in a typical February when there are no other blooms, it is particularly welcome. I’ll often venture out in early February to see if the buds have begun to open (below), and I’m cheered if only a slight bit of red or yellow is showing. 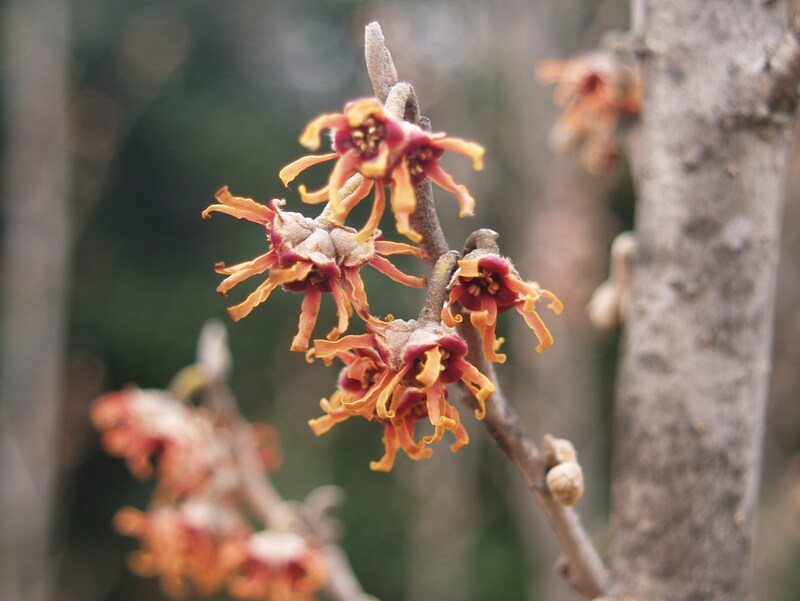 This year there are so many other flowers in the winter garden that I’ve been spoiled into taking the witch hazels more for granted, but they are wonderful plants, certainly worthy of inclusion in any garden. Neat. I’ve never seen witch hazel growing! You must be careful with suckers that grow from below grafts. These will often grow more vigorously than the part above the graft, and this can cause the grafted section to decline. Suckers are usually pruned off to prevent this, but you can monitor its growth and prune it at any time when it appears that it might cause a problem.